Hot Dog! 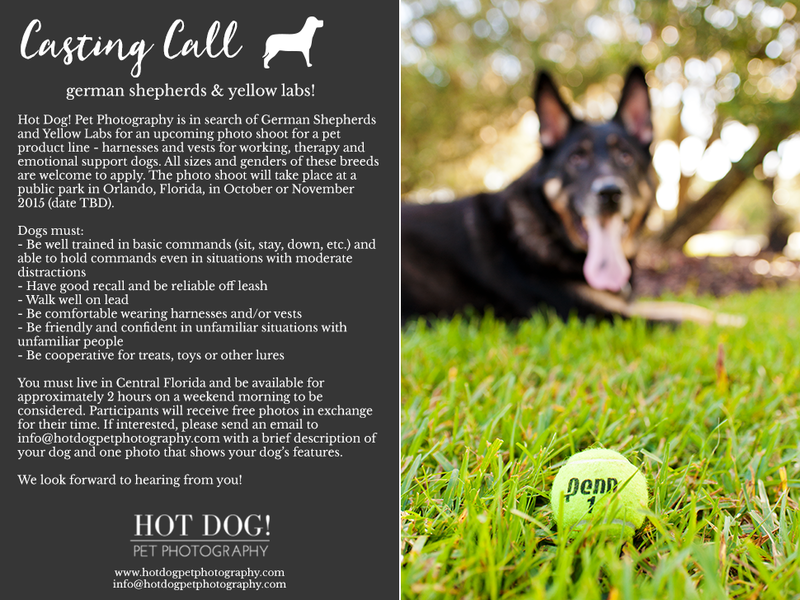 Pet Photography is in search of German Shepherds and Yellow Labs for an upcoming photo shoot for a pet product line – harnesses and vests for working, therapy and emotional support dogs. All sizes and genders of these breeds are welcome to apply. The photo shoot will take place at a public park in Orlando, Florida, in October or November 2015 (date TBD). You must live in Central Florida and be available for approximately 2 hours on a weekend morning to be considered. If interested, please send an email to [email protected] with a brief description of your dog and one photo that shows your dog’s features. Note: All participants must sign a model/ property release and sign our photo agreement to receive their free images!